If I'm using a 16"(12qt)model would I double the recipe and cooking time? @Haz - The area of a 16" DO bottom is about 78% larger than that of a 12". Doubling the ingredient amounts would work just fine, but keep the temperature and cook times about the same. 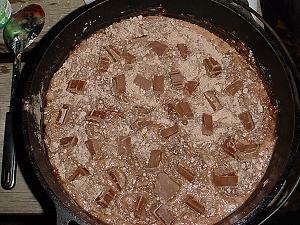 Our scouts have made this recipe twice for our summer camp dessert cook-off. They placed second and first. It's they're favorite dessert. Confused on quantities. Do you use entire can of sofa or only 6 oz? Also on cake mix do you leave out about 1/3 to 1/4 of the mix? @Scott - If you are not using a pie tin, then you can use the entire cake mix and about 3/4 can of soda pop. But, if you're putting it in a pie tin, just use 3/4 of the cake mix and 1/2 of the can of soda pop so it doesn't overflow the tin.